I used to remember that copying and pasting to the clipboard used to work a long while ago, but I just couldn't remember what exactly did I do in order to get it to work. That were the days where I was still bothered enough to tweak things to get it running - these days I just want to get things to work, which many will arguably retort that what I'm asking for is impossible. The compiler flag xterm_clipboard isn't compiled with standard text mode vim, that was the main reason that I had to recompile vim in the past! But these days, I'm lazy. I much rather not have to recompile and maintain my own packages if I have to, and it turns out that I'm in luck - a bit of digging showed that the vim-X11 package contains vimx, a version of vim that has the xterm_clipboard flag enabled. Happy days! The default RPM packaged version of 'Ant' that comes with Fedora/JPackage doesn't doesn't respect the $ANT_HOME environment variable the same way as if you have downloaded and installed it directly from Apache itself. 1) Put "ivy.jar" into our custom development distro by default into /usr/share/ant/lib. This is a nice option for all developers, since we won't need to do anything extra for it to work. But it isn't tracked by package management (ie not an RPM), and neither should developers put in the file into /usr/share/ant/lib just because we have local superuser rights, since management of these issues should be done by the sysadmin, automatically if possible. 2) Workaround this situation by having a local override of the Ant configuration. Create the following directory structure in your $HOME/.ant directory, eg. Copy the ivy.jar file into $HOME/.ant/lib directory. And these changes will allow you to compile use Apache Ivy natively without littering multiple copies of it per project. 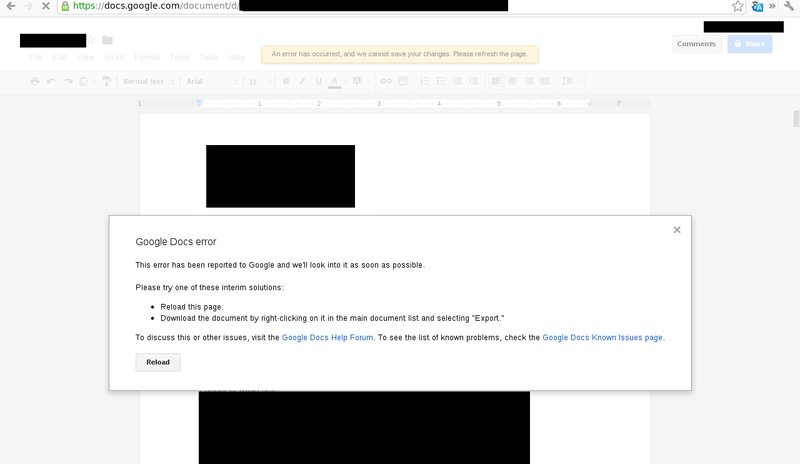 I solely use Google Docs, erm Drive, for working with documents these days. While it's named "Drive" now, I'll refer it as the old incarnation "Docs" as it's the document editor that I'm about to rant here. Google Docs as an editor, is simple to use, and is very accessible - there is no need to install any specific software for it, all you need to do is to open it up through the web browser. But the best thing I like about it, is that I can edit the document without a care and not have to worry about saving the document somewhere so that I can resume editing elsewhere later. Everything is available as long as I have access to the Internet. Now, that's all fine and dandy, except if you have a "slow" connection. And when I say "slow", I don't mean the archaic 56kbps speeds back in the heyday where people still dial-up a modem connected to a copper phone line. Slow in Google's context, apparently meant anything at mobile broadband speeds (@1mbps). Google Docs had been working fine, prior to the fairly recently change they've introduced the "we'll save as you type" feature. 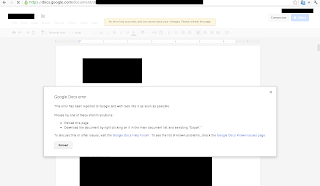 The old Google Docs wasn't that bandwidth hungry since saving the document was in coarser time blocks instead of the consistent synching that they are doing now. This error is consistently reproducible, and it's not even a complex document we're talking about here - it's essentially a text file editable by vim that I copy and paste into sometimes. I don't get how Google gets this so wrong - we're talking about a document editor for a simple file, for god's sake, what kind of network requirements do you need in order to make it work? !